General Hospital (GH) spoilers for Monday, March 26, tease that Jason (Steve Burton) will try to support Carly (Laura Wright). It won’t take long for him to see that she’s quite emotional. Jason will push Carly to open up, so she’ll talk about the significance of the scarf she found. 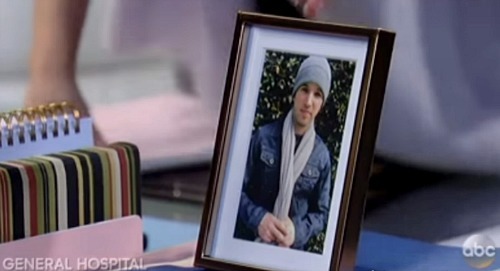 Carly will admit that she personally bought a scarf that looked identical for Morgan (Bryan Craig). She’ll show Jason the photo and contend that they were exactly the same. Jason will seem confused about all of this, so he’ll urge Carly to recap the story. She’ll get agitated about repeating it, but Jason will think it’s important to have all the facts. He’ll feel like it can’t hurt to see if they’re missing anything. Carly will recall walking into her office and finding the scarf on her desk. She’ll note that it looked pretty rough. Thanks to Nelle’s (Chloe Lanier) handiwork, the scarf was covered in grime and blood stains. However, Carly will reiterate that it was recognizable. She’ll pick up Morgan’s picture again and contend that it was either the same scarf or one just like it. Jason will ask a few more questions to get to the bottom of this. He’ll wonder how long the scarf was in Carly’s possession. After Carly points out that she had it for a few minutes, Jason will ask about any other identifying marks. He’ll hope that maybe there was a label or something that might be helpful. Carly will insist that she was too focused on the condition of the scarf to notice. All the dirt and blood really left her spooked. Carly wasn’t worried about examining it for labels. She was just trying to wrap her head around seeing Morgan’s trashed scarf on her desk. Of course, the fire alarm Nelle pulled took Carly away from the scarf and that’s when she lost track of it. By the time Carly returned, it was long gone. General Hospital spoilers say Carly will beat herself up for leaving the scarf behind. She’ll think she would’ve been somewhat closer to solving the mystery if she’d taken it with her. Jason will note that Carly couldn’t have predicted that it’d be snatched up by the person who put it there. Carly will still be distraught, but Jason’s always got her back. He’ll do whatever he can to crack the case. GH fans can expect Jason to start digging for answers, so Nelle had better be careful. One wrong move and she could have Jason breathing down her neck. Nelle needs to keep an eye on that scarf, too. After all, it has her blood on it! How long can Nelle keep this plot going? Will Jason solve the mystery? We’ll give you updates as other General Hospital news comes in. Stay tuned to ABC’s GH and don’t forget to check CDL often for the latest General Hospital spoilers, updates and news.